Is There an Inside Plan to Lift Age Limit for Ugandan President? Who Will Stop Museveni's Age Limit Project in Uganda? Will the Masses Stop the Age-Limit Project? Kampala — A video bearing a passionate message by an unnamed narrator is being shared on WhatsApp. The worried narrator speaks of happenings 35 years ago, when his little brother, Yokana and his fiancée, Diana, were killed during the war that brought President Museveni to power. He says he escaped narrowly on that occasion. "I still hear the sound of gunshots blistering through the air, snuffing out all our dreams with every bullet," the narrator says. "While a new President came to power, my only family and all my hopes and dreams were lost. We cannot shoulder the cost of violent political change again." "Speak out about the lifting of age limit," the narrator says, introducing the subject of his latest worry. Activity around the rumoured plans to amend Article 102 of the Constitution to enable Mr Museveni to run for president in 2021, having already surpassed the current age cap of 75 years, is already frantic. Apart from the video, social media is awash with many other initiatives. Heated discussions are happening in a WhatsApp group that also has some ministers and ruling party MPs as members, for example. The ministers and MPs, some of whom have publicly spoken in favour of lifting the age limit to the presidency, are constantly accosted by members who are opposed to the idea, with the discussions often degenerating into open quarrels. In another initiative, activists have collated the telephone numbers of all MPs in the 10th Parliament, on whose shoulders the decision to lift the age cap could eventually rest if a Constitution amendment Bill is tabled in the House with that clause. The phone numbers are being widely shared on WhatsApp with pleas for people to call their MPs and urge them not to change the Constitution. In yet another initiative, some Ugandans have drafted petitions addressed to President Museveni, copies of which we have seen, urging him not to change the age limit for the presidency. Maj Gen Kahinda Otafiire, the minister of Justice and Constitutional Affairs, who could be charged with tabling the rumoured amendment proposals, was not in the mood to speak to us, saying he had no comment on the subject. But in an earlier story by the Observer newspaper, Gen Otafiire was quoted as urging Ugandans to be patient and wait to see whether the rumoured amendments will be tabled, in which case the will of Ugandans, he said, will prevail. But the waiting is arousing anxiety among Ugandans, hence the initiatives to try and stop the plan for lifting presidential age limit. Sunday Monitor reached out to a number of individuals involved in these early initiatives to prevent the lifting of the age limit to the presidency and members of the ruling party and security services. The picture that emerges is that a comprehensive plan has already been drawn to see through the lifting of the age limit and an initial deadline to have achieved the amendment has been set for end of 2018. Multiple sources told this newspaper that the designers of the plan favour a quick and early move so that by the time arrangements for the 2021 elections begin, the amendment to the Constitution will already be some distance in the past. "They are keen to ensure that the amendment is a distinctly different affair from the 2021 elections," one source told Sunday Monitor. President Museveni, who officially turns 73 in September, will be only four months shy of 77 by the time his current term expires in May 2021. He will legally be able to rule beyond 75 years old because the Constitution only prescribes age at standing for election and does not require one to relinquish the presidential official if they hit maximum age in the course of their term. Mr Museveni has already benefitted from a change of the Constitution, when in 2005 the two five-year term cap to the presidency was removed. Both the term and age limits were written into the 1995 Constitution, whose making Mr Museveni was accused by colleagues like Dr Kizza Besigye of having tightly controlled. If the two five-year term limit had been observed, Mr Museveni would be over a decade into his retirement, having hung his political gloves in 2006. The removal of the term limits in 2005 was in a way sweetened by the return to multiparty politics, which Mr Museveni's ruling Movement had proscribed for the first decade of their rule. It therefore appeared like give-and-take, with Mr Museveni's opponents being allowed some leeway to organise through their parties while Mr Museveni had the road block to extending his rule removed. A source conversant with the ongoing plotting to remove age limit to the presidency told this reporter that as a sweetener, the proposal to remove age limit will come alongside another proposal to reinstate term limits, so that one may be elected president at any age, but may not rule beyond two terms. The discussion around this, we have been told, has explored whether then Mr Museveni, who is into his fourth decade as President, would not be deemed ineligible to run again, having done much more than two terms during the current constitutional order. We are told an exception for him in this regard is being broached. When Mr Museveni pushed through with the lifting of term limits in 2005, another leader, Gen Olusegun Obasanjo, then president of Nigeria, failed to push through a similar amendment in Nigeria despite having paid a visit to Mr Museveni late during his presidency in what was widely interpreted as an attempt at seeking advice. In the current planning for lifting the age limit, this reporter has been told, a team was sent to Burundi on a fact-finding mission. Burundi president Pierre Nkrunziza plunged his country in bloodshed when he insisted on running for a third term despite an existing two-term limit to the presidency. Mr Nkrunziza argued that he had only served one term under the existing constitutional order and was entitled to running for another term since his first term predated the constitution. Scores were killed, a coup was announced but quelled, many Burundians fled the country as refugees. The fact-finding mission to Burundi, our sources say, was to study what went wrong in the plan so that it is not repeated in Uganda, especially since it is anticipated that there will be resistance to the amendment. Speaking of resistance, our sources say that a comprehensive plan has been laid to quell resistance and activism against the plan, and particular police and military officers (names withheld) have been designated for the purpose. We have been told that certain sections of the police and military are likely to be enhanced, and more equipment will be procured for the purpose. Money will flow, West to be left out. Whereas there is a plan to "crush" any resistance to the planned amendment, our sources say, the preferred approach is to obtain the acquiescence of as many people as people, and, our sources say, money has been piled up to help in this. We have been told that key opinion leaders, especially religious leaders, will be targeted. Our sources say they will be offered money to keep quiet about the amendment or speak in favour of it, whatever they prefer. But even those religious leaders who may not be comfortable taking money, we have been told, will be required to keep quiet. We have been told that two top NRM leaders are already fighting to take charge of the amendment process, especially because of the huge money that have been put in place to facilitate the process. A source told us that ruling party MPs and other members are already cashing in. For instance, we have been told, each NRM member was previously paid Shs500,000 per sitting in the NRM Caucus, but that that money has since been multiplied six-fold to Shs3m. Members of the ruling party's Central Executive Committee who don't hold public office, we have been told, will start earning salary, bagging Shs25m per month. Their counterparts in the National Executive Committee (NEC) who don't hold public office, our sources say, will each earn Shs9m per month. We have also been told that there are some members of the ruling party who are uncomfortable with the rumoured amendment and would like Mr Museveni to retire. Our sources say that some of the loudest opposition or at least apprehension from within has come from Western Uganda, where Mr Museveni hails from. For this and one other reason, we are told, the champions for the amendment have been handpicked from other parts of the country and not the West. The other reason the championing of the amendment has been assigned to people from other regions, sources tell us, is that the planners of the amendment don't want the issue to be viewed as "a western thing". As the planners hold their game plan to their chests as anticipation mounts among members of the public, the narrator of the video referred to in this article makes a call to Ugandans: "Let us all appeal to the goodwill of President Museveni to finish well and set a legacy as the first President to leave office peacefully when his term of office comes to an end. This honorable, selfless act of patriotism will serve as an example to all Presidents of Uganda." 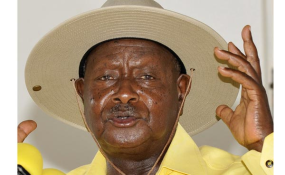 At the height of the attempts to lift term limits reached fever pitch in 2005, the late Eriya Kategaya, who was widely referred to as Mr Museveni's childhood friend, appealed to the President to "seize the moment and be the first President to hand over power peacefully ... we cannot have a country where all Presidents keep running away." Article 102 (b): A person is not qualified for election as president of Uganda if he or she is less than thirty-five years and or more than seventy-five years of age. At a press conference during his tour of West Nile in November 2015 during campaigns for the 2016 elections: "He [journalist] was saying the Constitution talks of 75 [as the age limit]. Now, what am I planning to do? I will follow the Constitution." "I am not interested in age-limit talk,"Mr Museveni." On NTV's On The Spot programme: "After clocking 75, I will not support the lifting of the age limit to allow me to contest for another term of office." Museveni responding to a question on whether he supports age limits: "I think that after 75,the vigor... I think there is some scientific idea there that maybe the vigor is not as much after 75 years. That one I would not quarrel [with it]. I know there are some leaders who have been leading even beyond 75 but I think if you want very active leaders, it is good to have the ones below 75." Responding to a particular question on whether he would rule beyond 75: "Not at all. Certainly not." Responding to a question during an Al-Jazeera interview on whether there are plans to amend Article 102(b) to allow him run for presidency for the sixth time in 2021: "I cannot change the Constitution because I do not have that power," Museveni." "I gave you a report and the Constitution and they are available. If you don't want to read the Constitution, at least read my report and then you add and subtract. That was my job and contribution, read and internalise. All what I have to say is there," Benjamin Odoki, former Chief Justice. "The President himself has said he does not want it, so the President has made it clear that he does not want it. Why do people force the issue? They should not force the issue. That is where we go wrong and mislead our leaders," Apollo Robin Nsibambi, former Prime Minister. "This is a matter that should not even be discussed. It was resolved by the Constitution. There is no reason that has been given as to why it should be removed. There was also this idea of peaceful change as an aspect," John Kawanga, former DP National Vice President. "I really don't understand what the discussion is about, didn't somebody read the Constitution or does somebody want the Constitution interpreted? That is why I set up these community libraries in the hope that people can read and understand and life goes on," Victoria Sekitoleko, former Minister of Agriculture. "What you are calling a Constitution is for politicians. The question for me is whether the society has control over its affairs, including its politicians. How can citizens take charge of the direction of their country? Politics cannot only be about officials. What about the economy? We as a people should give directions over the affairs of our lives. On the age limit, the debate has been missed and as usual it will end up at dolling out a few favours and offices to politicians," James Agode Ikuya, a veteran politician.